Way, way back in the autumn, when I first arrived in Tokyo (this time round, anyway), I wanted to eat ramen almost immediately. As any ramen fan should. Plus I had a visitor from the UK, which made it all the more imperative that we should eat ramen. 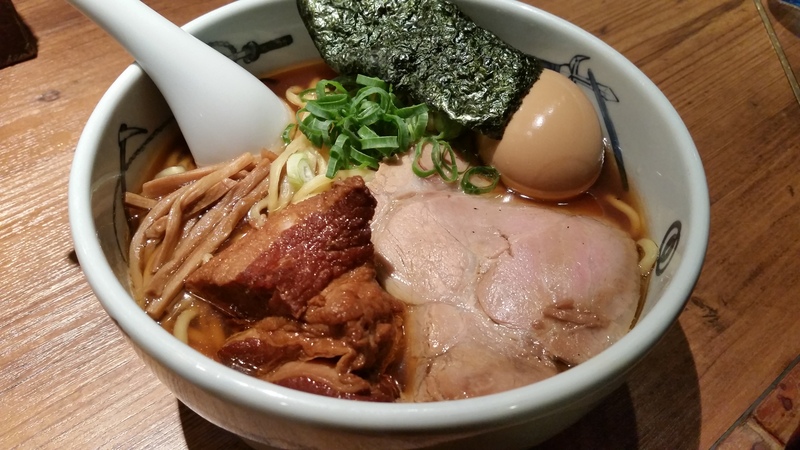 Menya Musashi (麺屋武蔵) is one of the most popular, with several branches, their Shinjuku branch being particularly famous. 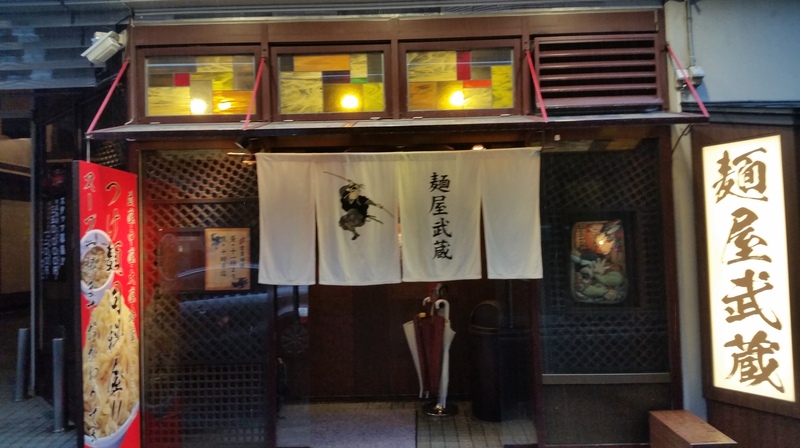 Menya Musashi is not far from Shinjuku Nishi-guchi and is just off the main road. Ducking under the drapes, the store is dimly lit with wood panels and a lot of traditional Japanese items decorating the walls. They have a little samurai character who represents the brand, and he appears everywhere, from the drapes to the bowls. Ordering is at a vending machine with nice clear pictures. It’s not cheap, with their standard bowl of ramen starting at 1000円 plus tax, but they are famous for some seriously delicious pork belly. 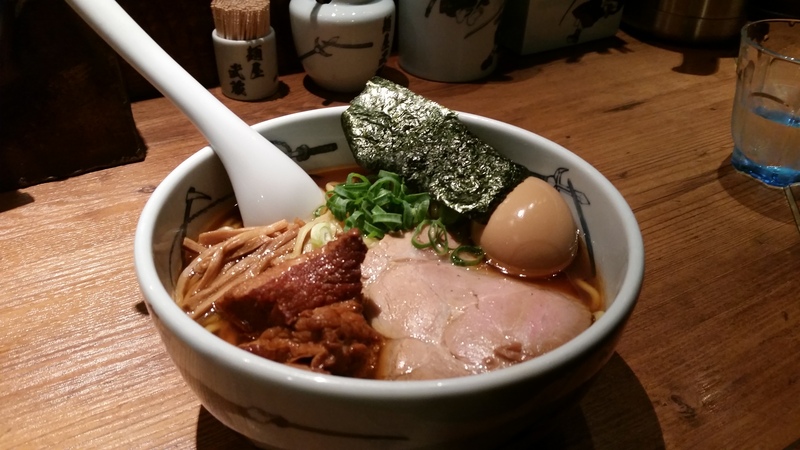 The staff will then cheerily take your ticket, calling out orders in one big team hey-ho ramen chorus. It’s really quite fun, and makes you feel welcome. And the pork belly really was truly delicious. My issue, however, was with the broth, which was not only incredibly salty but seemed to be a mixture of tonkotsu (pork broth) and fish (bonito perhaps). This just wasn’t executed to my tastes, nor to my dining companions, and we both left with a rather unpleasant after-taste… that plagued us until the next day. I woke up with a mouth so dry and rancid that I felt like I’d drunk 7 litres of beer sprinkled with the dust from several ashtrays. Yet Menya Musashi is so popular, I can’t help wondering – did I miss something? Did I order the wrong thing? I haven’t tried their ramen since, but I did enjoy their very special chocolate tsukemen for Valentine’s Day. Check it out! Next Bacon Fat Sizzle Time: Making Brunch in Tokyo – UK-Style! Oh no, that’s tough! I heard the safe bet is just to choose the top left as it’s there standard/classic, and pretty much always the cheapest!